This year's school council have now been decided, thanks to our democratic voting in each class. Pictures and the School Council Vision will be uploaded soon. This year, our school council have helped run our charity day, supporting Carlisle Food Bank. The children raised an impressive £444, making a huge difference to the lives of many. Well done. Future school council projects will be the purchasing of new books for our pupils to enjoy reading. They will also plan and map out new sports provision for the school playground and field. 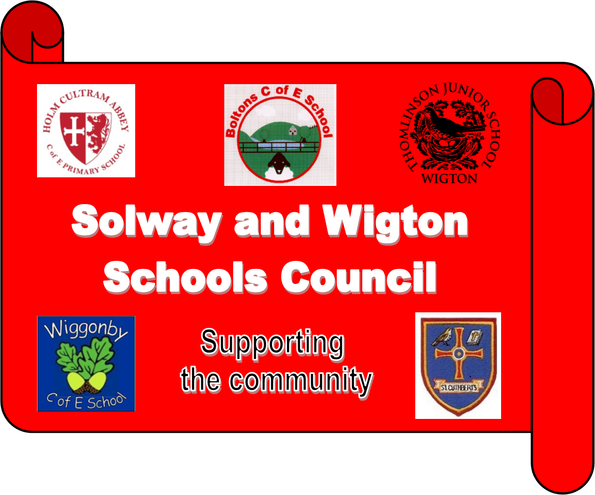 Our projects have included our involvement in a schools cluster council to work on a joint project with Wigton Baths. The children aim to raise funds to support the baths and are currently meeting to share ideas. We contribute to decisions made in school, whole school improvement planning and fund raising. The Solway and Wigton School's Council made bags for life to sell and raise funds for Wigton Bath's Trust. You can buy these from the baths or any of the schools involved in the partnership. Wiggonby School Council presented Wigton Baths Trust with a cheque for £70.